Xi’an is way up in the middle of China, and was the original capital, from the time of the violent unification of the Six Kingdoms by the first emperor, Qin Shihuang, before 200BC, until it was moved to Beijing about 600 years ago. It has the world’s biggest city wall, a modern rebuild but encasing the earlier work, a 12km rectangular perimeter, and very impressive too. 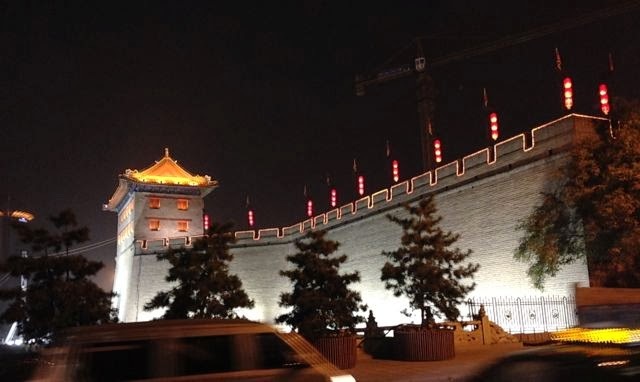 At its centre is the Ming-era Bell Tower, which used to chime out to regulate the hours of the great city. From it, wide avenues radiate to the city gates north, south, east and west. Of course, the city now spills out well beyond the centre, and major construction is as evident here as everywhere in China. Quickly through two more new mega airports, and a Wacky Races style taxi drive, and we are in the centre of Xi’an. First impressions: a bit more down at heel than Chengdu, cooler, more dusty. More edgy, more exotic. On a first walk round, we found ourselves in the area occupied by people of the Uighur nationality (or Hui to Hong and Chinese people generally), a Turkic muslim people from China’s distant west bordering Kaskhstan. This district is full of old shop houses selling dates, rose-flavoured peanut brittle, freshly squeezed pomegranate juice, and meat, chopped up for you right on the street. More middle eastern than far eastern, in atmosphere and in the look of the people. 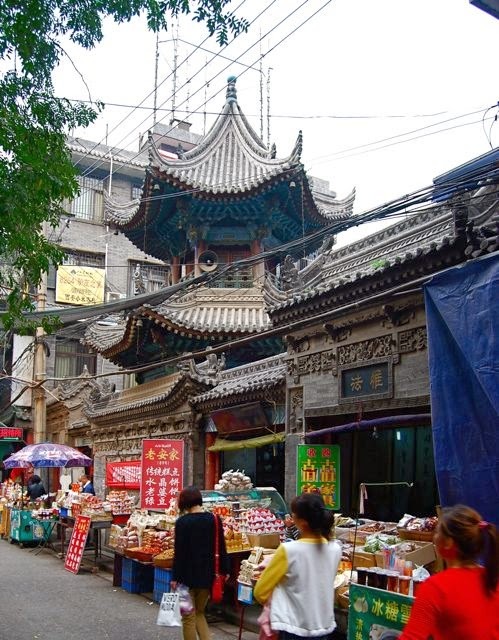 There is also China’s oldest surviving mosque, founded in the 7th century AD, complete with a pagoda style minaret. A series of quiet outer courtyards lead to the mosque itself, all very like a Chinese temple in layout and detail. In the evening we sample Uighur cuisine, very meaty, spicy, and exotically flavoured. After becoming the capital, it developed as a major trading centre: it was the eastern end of the Silk Road that saw rare goods carried back through the deserts to the west, to Lebanon, Egypt and from there to Europe, with European products such as iron goods coming the other way. The Uighur presence here no doubt owes its origins to this trading route.